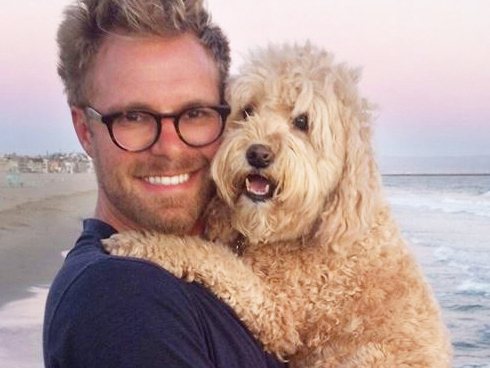 Given that our shop dogs have their own blog on this very site, it should come as no surprise that we at Parnassus Books love the work of Seth Casteel, the New York Times bestselling author and photographer behind the blockbuster book, Underwater Dogs. Of course, we’re absolutely gaga over his newest production, Underwater Puppies — because if there’s anything even cuter than dogs playing fetch in the water, it’s baby dogs playing fetch in the water. Enjoy this clip two ways: 1. Click over to watch the video from NBC Nightly News. 2. Observe how Brian Williams and the dog are making the same face in this still shot. You’ve done some really cool work facilitating pet adoptions, a cause that’s near and dear to our own hearts. Can you tell us a bit about that, and what kind of difference a good photo makes in the adoption process? SC: One Picture Saves a Life – it’s that simple! I began my career as a photographer as a volunteer with local animal shelters, taking positive adoption photos to help dogs and cats connect with families. Since then, I’ve launched OnePictureSaves.com with GreaterGood and Celebrity Groomer Jorge Bendersky. We teach workshops at animal shelters all across the United States about how grooming and photography can increase adoption rates. The results have been incredible! For a homeless pet, a good photo is one of the BEST ways to catch the attention of a potential adopter! Our even bigger mission is to improve the image of rescue and adoption so people understand the shelter is a place full of wonderful pets ready to join families. SC: The images are all photoshopped. Just kidding. When the photos first became popular in 2012, many people suggested that “tennis balls don’t sink” and “those must be fake.” I had to laugh out loud at the comments because it’s not rocket science — you can easily cut a hole in a tennis ball, or pick up one of those squeaker ball tennis balls that can take on water. The setup for Underwater Dogs vs. 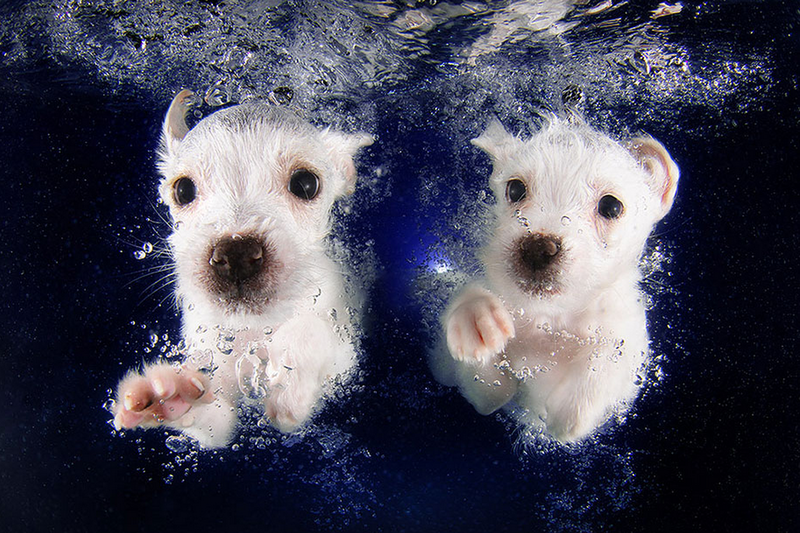 Underwater Puppies varies slightly. For Underwater Dogs, it goes like this: Meet-and-greet with the dog, and we become friends. Begin to play fetch on land and then move into the water, where I expand the game of fetch into a series of unique fetch-based games designed for the pool. A shoot typically lasts about a half hour, depending on the dog’s usual exercise routine and level of enthusiasm. Most dogs want to play all day if they could! I’m under the water with the dogs, sometimes only a few inches below the surface, but other times over 10 feet deep. The dogs are all pursuing the ball (or other toy), but yes, on occasion, they may get confused, or can’t find it, and come after the camera, or my foot by accident. I’m pretty fast though! For Underwater Puppies: This project is based on water safety for pets rather than a game. Swimming pools are so much fun, but can also be extremely dangerous for our pets since they aren’t natural bodies of water. I personally gave swimming lessons to hundreds of puppies, teaching them about buoyancy, how to be confident and calm in the water, and most importantly, how to get OUT of the swimming pool. This is the most important message of the book and I encourage all pet owners to ensure their pets are safe around the water. Throughout the course of teaching lessons, I found that a number of these pups turned curiosity into confidence and embraced the pool, leaping in on their own and even chasing toys! These are the photos you will see in the book. Not to get too far ahead of ourselves, but how’s your next project, Underwater Babies, going? SC: I have to say that I’ve always been more of a “dog guy,” but I’ve been so inspired by these little babies who are also learning about safety and survival in the water. I’m tremendously excited about these images and even more excited to create further awareness about the imporrtance of infant swimming lessons! Up until a few months ago, I thought I’d probably just always have pets and no kids, but now that is up for debate. I just have to find a nice girl to settle down with, though! Meet the newest addition to our family: Woodstock! This little rescue pup (right) is the new baby brother of shop dog Eleanor Roosevelt (left). Here’s a video our co-owner, Karen, took of Woodstock meeting Niki (our marketing and events director and owner of shop dog Gracie) and Cat (manager of online orders and owner of part-time shop dog Belle) and fellow shop dog, Bear. Bear is very gentle around puppies and will probably be doing some babysitting.